The blue/light gray Flipside Sport 15L AW Backpack from Lowepro is a lightweight technical daypack for the outdoor shooter who needs to carry his gear in rough venues while maintaining the ability to gain rapid access to it. This pack allows you to pack your pro DSLR with grip and up to a 300mm f/2.8 lens attached making it a great choice for the nature or sports photographer. 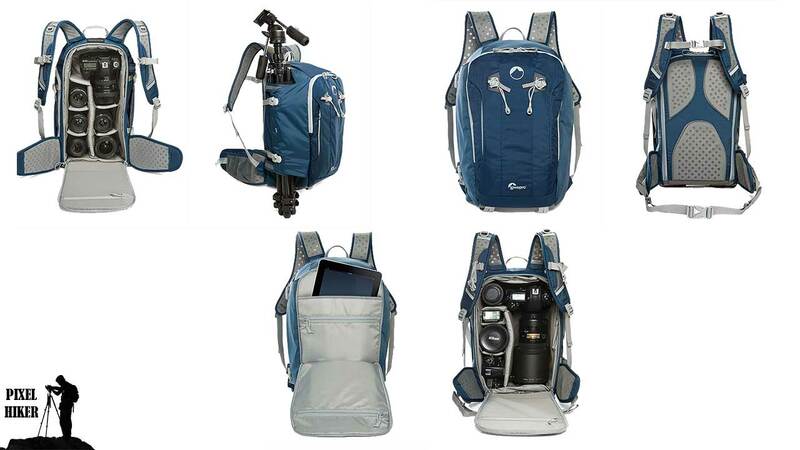 It will also accommodate an extra 1-3 lenses or flashes as well as your tripod or monopod. Plus, since Lowepro understands that remote locations don’t often have water fountains available, the pack will hold an optional 1 liter hydration reservoir. The Flipside 15L is made from a tough combination of nylons and polyurethane and will stand up to moisture well with its exterior silicone waterproof coating. For extreme foul weather, the Flipside comes with a rapidly deployable all-weather cover. If you’re a mountaineer, it will also hold your ice axe or trekking poles. 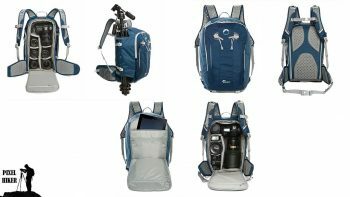 It’s also a fast access pack with side access openings that eliminate the need to remove the entire pack to retrieve your camera and lens. The pack contains a handy, removable and adjustable camera compartment that gives you the freedom to pre-pack your gear and remove it when you want all your gear in front of you for a shoot. The padded dividers keep your gear safe and nestled within their own configured compartments. This removable compartment contains a handy storm flap to protect it from the elements you will inevitably come up against. The waist belt gives you the option to slip out of the shoulder straps and let the pack unfold in front of you so you have complete access to the pack’s contents without removing it. This feature resembles having a table set out in front of you. The shoulder straps are wide and adjustable and supported by an additional sternum strap that provides additional balance while hiking. They contain perforated and breathable air channels for heat dissipation all designed for maximum comfort while outside. Multiple adjustment points on the pack assure an ergonomic, feel good fit. Nature shooters will appreciate the secure side attachment system that holds your tripod, held by a wide flap with buckles. For small accessories, the back panel has a zippered pocket. Speaking of zippers, they all have long pull tabs that are easy to use when you are wearing gloves. The Flipside 15L is backed by Lowepro’s standing lifetime warranty. Adjustable waist belt and shoulder straps. Have total access to your equipment without removing the backpack by slipping off shoulder straps with the waist belt still fastened, and bring the pack in front of you. Great pack too bad it’s discontinued!